Tonight's topic was Islam & Christianity. If you are interested in the history of Islam and how it relates to Christianity, Andy Stanley has some excellent messages that you can download for a few dollars that are well worth your time and money. If you are interested, click here. Also, if you missed the previous three weeks where we learned about mormonism, catholicism and Jehovah's witness, simply click here. I finally watched the Bucket List tonight. It was a great movie. It reminded me of the series that we just completed a few weeks ago called, "One Month To Live." The movie re-stirred some powerful emotions in me about seizing today and living life to the fullest. This video is pretty awesome and it is one of my favorite songs from the series. Chad did this song live and there wasn't a dry eye in the place. If you missed the series you can check it out on our website (freedomlife.tv) via iTunes. Also, check out www.onemonthtolive.com for some great resources about putting life into perspective. I found out yesterday that a person I prayed before the one month series began recently passed away. The person was diagnosed with terminal cancer without warning and lived only a short time. It reminds me that life is fleeting and we need to live for Jesus today. Say what you need to say and do what God is calling you to do today! From Joel Osteen Ministries today! "This is the day the Lord has made, we will rejoice and be glad in it" (Psalm 118:24). Every day that we are given is a precious gift from Almighty God. We should wake up every morning with a grateful attitude, full of faith and expectancy for what the Lord has in store. Sure, you may be facing some challenges in your every day life, or maybe things aren't going the way you planned, but remember, each new day is a chance to stand strong in the midst of adversity and see the faithfulness of God. Every new day is an opportunity to praise and thank Him; to magnify your God instead of magnifying your problems. This is the day that the Lord has made, let us rejoice and be glad in it! Be glad that God has promised to never leave us or forsake us. Be glad that God has given you a sound, healthy mind. Rejoice that He is making a way where there seems to be no way! As you focus on the gift of every day and rejoice in what God has done in your life, you will begin to experience His increase and blessings. You'll rise up higher and set the course to live in victory all the days of your life! Heavenly Father, today I choose to rejoice in You. Thank You for this day and for every opportunity that You've given me to bless and praise You. I give You everything I am today and always. In Jesus' Name. Amen. I just got this from Ed Young's ministry today, enjoy! Did you realize that you don't have to wear camouflage or be stationed overseas to experience combat? Everyday, you and I can find ourselves engaged in different conflicts. And one of those is verbal conflict. Some of those conflicts are battles; others are full-blown wars. Have you heard of the military weapon called the 'smart bomb'? It's a bomb that is designed to hit a specific target. Well, when we find ourselves immersed in verbal battles with people in our lives, so often our weapon of choice is a 'dumb bomb'. We launch those vocal bombs to assassinate someone's character or destroy their self-esteem. But unlike the smart bomb the military uses, our dumb bombs explode and not only damage the person we're attacking, but also they end up damaging us. God doesn't want quarreling, back-biting or fighting to be part of our verbal arsenal. Instead, he wants us to use words that build others up and create a sense of his ultimate peace. Life is too short for fussing and fighting. Instead, look for ways to create the peace. Dear God, It can be so easy to launch verbal missiles at people I disagree with or don't like. Help me in those situations to create peace and understanding rather than dissention and destruction. Help me to communicate only words that will point others to you. In Jesus. name I pray, Amen. This week was a big week. Not because of big meetings, vision development or any number of things that I could post about. 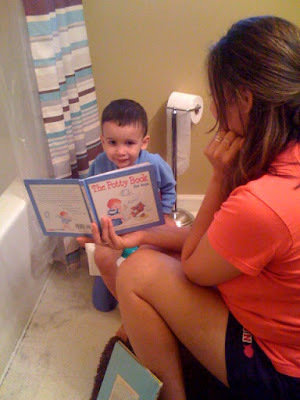 No, this week was a big week because my son Carter is potty training. Yesterday he went to the potty (number 1 & 2!) for the first time ever in a real potty!!!! I'm pretty pumped about that moment, although it seemed to freak him out a bit. My wife is doing a great job training him and it is always wild to see your kids grow & develop. It's also great that he is making progress since he will be giving me a $40 a month pay raise by switching from diapers to underwear. I hope your week is as big as mine! Tonight's topic is Jehovah's Witness. If you can't make it but would like to watch the video, click here. This video is courtesy of www.lifechurch.tv and is well worth your time. If you missed the video from last week about Catholicism, click here to catch up. Enjoy! Today's message was called, "Reverse the Curse." Most of you have heard about the 'Curse of the Bambino.' The supposed curse that began in 1920 when Babe Ruth was traded to the New York Yankees from the Boston Red Sox. In sporting folk lore that act brought about the rise of the Yankees and an 86 year world series drought for the Red Sox. The reality is that we are under the curse of sin because of one man's actions, Adam. But God has provided the freedom through one man, Jesus Christ, who broke the curse of sin at the cross. When we step across that line and follow Jesus, our past is erased and our future is secure, curse broken. Though the curse of sin is broken, often times sin can be 'passed' down through the generations. We talked about how to break generational behavior that goes against God's plan for our lives. I put in the notes that I would have a link to some scriptures that you can confess over your life to renew your mind and help you prepare for generational blessings. Our desire should be that we would become all that God has called us to be and that we would pass the blessing to our children, grandchildren, friends & family. Click here for a list of scriptures that you can memorize, meditate on and build up your inner man with. The curse is broken and God desires to help us pattern our lives after His Word and not what has been passed down to us from our family & friends! Last night at the end of our cafe I shared about how Jesus told us that the Gates of hell would not prevail against his church. The teaching had incredibly deep meaning to His disciples. The Gates of Hell was a real location in the ancient near east and you can check out what Jesus meant by reading more about it right here! Last week we are launched our mid-week cafe and for the next few weeks we will be continuing a study called, "What's The Difference?" We will have live acoustic worship, a excellent video that explains the topic and stimulating discussion. Tonight's topic is Catholicism. If you can't make it but would like to watch the video, click here. This video is courtesy of www.lifechurch.tv and is well worth your time. If you missed the video from last week about Mormonism, click here to catch up. Enjoy! Just in case you missed it! The funniest Father's day video around! This past Sunday we showed a hilarious video highlighting a special gift idea for your Dad this Father's day. Click here to get a great laugh and what the video! Here is a good devotional I got from Ed Young's Ministry today. Saying we have faith in Jesus is one thing. But putting substance behind those words is another thing entirely. If you call yourself a Christ follower, God calls you to display an authentic faith. And you do that by guarding the words that come from your mouth, not just the thoughts you have in your mind. In this passage, David asks God to put a guard over his mouth because he knew that the words he spoke did more than just communicate what was on his mind. The words we choose communicate the truth about our faith in God. If your heart has been transformed by Christ, it's time to take an honest look at the words you speak to those around you. Do those words reflect your transformed heart? Ask God to help you choose only those words that will honor him and reflect the truth about your faith in him. Dear Lord, I know that the words I choose do more than just reflect a thought or feeling; I know that they reflect my faith in you. Because of that, help me to choose words that will point others to you. In Jesus' name I pray, Amen. The words that we speak over our lives are really important because Jesus taught us that our words come from the inside, from our hearts. Today's devotional will challenge you to not only watch over the words that you speak, but ultimately to examine your heart and let God's word be the deciding factor in your heart, your thoughts and ultimately your speech. “And since we have the same spirit of faith, according to what is written, ‘I believed and therefore I spoke,’ we also believe and therefore speak” (2 Corinthians 4:13). Every believer has been given a measure of faith. In order to see the promises of God come to pass in your life, you have to give your faith a voice. You must declare what God says about you in His Word. Those seeds of faith inside you are activated when you speak them out into the atmosphere. That’s why the scripture tells us, “Let the weak say I am strong. Let the poor say I am rich.” When you give your faith a voice and send forth the Word of God out of your mouth, the Bible says that He watches over His Word to bring it to pass in your life. Don’t dig up your seed by speaking against His Word. Don’t allow words of defeat or negativity to come out of your mouth. Instead, water your seed by continuing to declare the Word of God. When you wake up every morning, thank Him that His promises are coming to pass in your life. As you do, you will see those things come to pass, and you will live the life of victory God has prepared for you. Father in heaven, I humbly come before You giving You my thoughts, my actions, and my words. Help me to activate my faith by speaking Your Word daily. May my words and thoughts be pleasing to You always. In Jesus’ Name. Amen. Tonight we are launching our mid-week cafe and for the next 4 weeks we will be doing a study called, "What's The Difference?" We will have live acoustic worship, a excellent video that explains the topic and stimulating discussion. Tonight's topic is Mormonism. If you can't make it but would like to watch the video, click here. This video is courtesy of www.lifechurch.tv and is well worth your time. I've found that most men (including yours truly) are backseat drivers when they are driving with their wives or other woman (and sometimes men). There is something that goes off in a man's brain when a women drives that causes him to forget that they have the same license that he does. I've watched my father do it and I've even find myself doing it sometimes. When does backseat driver syndrome begin? I'm not sure but I know it starts as early as 5 years of age. 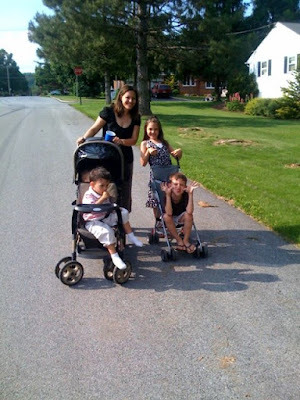 Case in point, we were taking a family walk this week and my son Caleb, who is 5, was fine as long as I was pushing his stroller. (he pretends to be sick sometimes so he doesn't have to walk but that's another blog entry) The moment Mikayla would push his stroller he would start complaining that she was going to fast or to slow or almost ran into something. I'm sure they'll have a medication to cure him by the time he is older but it was hilarious to watch him act like a grown man already. He already has B.D.S., keep him in your prayers! I read this today and thought it was great. I'm counting down my final days in our one month to live series. If you have more than one month to live, these ideas will help you prepare for your future. I love this quote, "Get busy living or get busy dying." A personal growth plan will help you get busy living! Do you have a plan for personal growth? Are you doing anything intentionally and strategically to better yourself? Understand today that growth is not automatic. You can have success but that doesn’t mean you’ve reached your highest potential. There is always room for increase. There are greater mountains to climb and new frontiers to be explored in life! So many people fall into "destination disease" where they think they have arrived just because they reached a certain goal. They think that since they accomplished something, or got their degree, or a certain position, that they can just kick back and coast on what they’ve already learned. But, in order to continue advancing in life, we have to take responsibility for our own growth. We have to have the attitude, “How can I improve. What can I do to make myself better? We have to stir up that desire to learn. We should have a goal to grow and learn something new everyday. It can be as simple as, “I’m going to get up every morning and spend the first twenty minutes meditating on God’s Word and thanking Him for what He’s done.” “I’m going to listen to a teaching CD on the way to work.” “At night, I’m going to turn the TV off a little bit earlier and read a book for twenty minutes.” “I’m gong to hook up with my mentor twice a month and go out to lunch.” “I’m going to be at church every weekend.” That’s a growth plan. As you take responsibility for your personal growth, God will honor your efforts. He’ll give you the right breaks. He’ll give you the right opportunities and He’ll help you rise higher and higher. As you continue to grow, you’ll see every dream and desire God has put in your heart, come to pass!